When Jill Morgenthaler arrived at boot camp in 1975, she was part of the inaugural class of women in the Army. She was one of 83 female cadets on a base of 50,000 men. 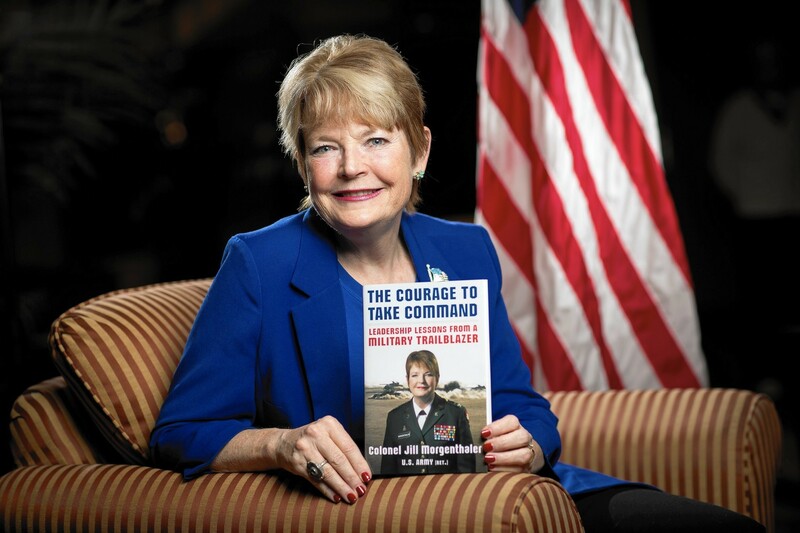 Colonel Jill Morgenthaler (Ret.) went on to serve three decades in the U.S. Army in positions such as: the first female military intelligence commander in the DMZ in South Korea and Germany (West Berlin), the first female battalion commander of the 88th Division, and the first female brigade commander in the 84th Division. In her book “The Courage to Take Command,” Col. Morgenthaler talks about how the military taught her that leadership isn’t about “command and control.” Rather, it requires a fine balance of reason and emotion, distance and familiarity, hard and soft power. It is assumed that leading in the military means just giving and following orders. The reality is that the same leadership skills are needed to motivate troops as you need to motivate employees. This is one of the reasons why there are so many companies interested in hiring our Veterans these days…not for a particular skill they acquired while serving but their experience in leadership. One thing you will notice from her list is that she talks about focusing on her team rather than her own personal success. The reason: her success will come as a result of her team’s success. In combat, every soldier knows they have a job to do but that they must also be able to depend on each other for safety and survival. This is not unlike the corporate world where an employee is hired to carry out a certain job but must also participate as part of a team – their personal “job security” is also based on the success of their department. Most managers, especially new managers, have the assumption that all employees should do what they are told. Think about how many ideas may go unheard when an employee doesn’t feel their manager appreciates them. How many mistakes happen or go uncorrected because employees don’t think their manager cares or they are too afraid to speak up and say anything. How much harder is it to motivate an employee that you dictate to then an employee who you have made feel a “part of the team”. Not every situation will be perfect. There will always be those troublesome employees or unexpected hiccups during a project or in the market that will affect “how” you lead, but if you have made it a goal for yourself to be a truly effective leader then take the list above and give yourself a performance review. If you are already encompassing these traits, don’t forget to help teach them to others especially your own employees that you hope to groom for leadership roles. What if you own manager doesn’t follow these suggestions? Don’t let that stop you from creating change in your own department! Sometimes, there are those that need to see the success of others before they embark on trying the change themselves. Be the example. If will help you go a long way in carrying out your job and building morale among your employees. Next postHR Would Be Better If….